Submitted 10 months 2 weeks ago by feeds user. 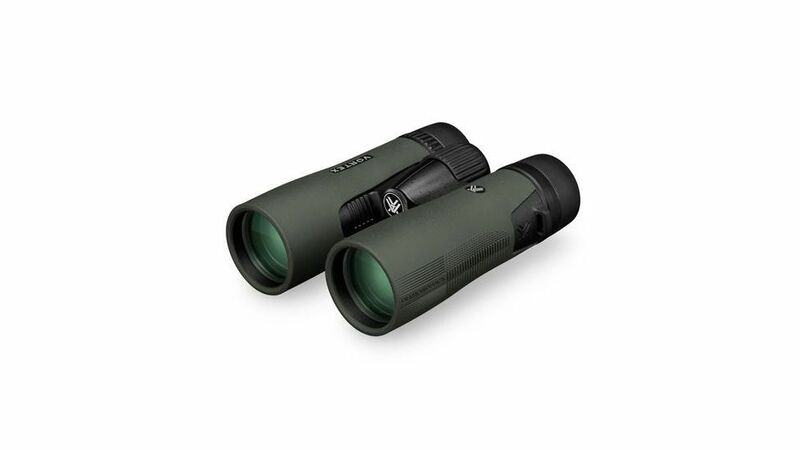 Product Info for Vortex Diamondback 10x42mm Binoculars Vortex Diamondback 10x42mm Compact Binoculars are superior quality, high-performance hunting optics at an affordable price. Their long distance power will let you close in on details missed by other brands. These Binoculars from Vortex feature fully multi-coated lenses for increased light transmission, and phase correction for enhanced resolution and contrast. Vortex Diamondback 10x42mm Roof Prism Binoculars are built rugged with rubber armor on the body for a secure, non-slip grip and durable protection. Vortex Diamondback 10x42mm Hunting Binoculars are sealed with O-rings to prevent moisture, dust, and debris from getting inside and argon filled to inhibit internal fogging. Specifications for Vortex Diamondback 10x42mm Binoculars: Magnification: 10 x Objective Lens Diameter: 42 mm Prism System: Roof Finish: Matte Color: Green Condition: New Package Type: Box Included Accessories: Comfort Neck Strap, Rainguard Eyepiece Cover, Deluxe Custom-molded Carry Case, Tethered Objective Lens Covers Exit pupil: 4.2 mm Eye Relief: 16 mm Weight: 24.4 oz Field of View: 345 ft at 1000 yds Optical Coating: Fully Multi-Coated Binoculars Focus System: Center Focus Twilight Factor: 20.5 Interpupillary Distance: Range 55 - 73 mm Close Focus: 5 ft Diopter Adjustment Range: Range -3 - 3 dpt Length: 3.75 in, 9.53 cm Product Weight: 2.25 lb Water Resistance Level: Waterproof Height: 5.9 in Eyecups Types: Twist-Up Tripod Adaptable: Yes Fogproof: Yes Width: 5.6 in Armoring: Rubber Armored Features of Vortex Diamondback 10x42mm Fogproof Binoculars DB-205: Fully Multi-Coated to increase light transmission with multiple anti-reflective coatings on all air-to-glass surfaces. Dielectric multi-layer prism coatings provide bright, clear, color-accurate images. Roof Prism for greater durability and a more compact size. Waterproof O-ring seals prevent moisture, dust and debris from penetrating the binocular for reliable performance in all environments. Argon gas-purged and o-ring-sealed for fogproof and waterproof performance. Prevents internal fogging over a wide range of temperatures. Rubber Armor provides a secure, non-slip grip, and durable external protection. Adjustable Eyecup twist up and down for comfortable viewing with or without eyeglasses. Center Focus Wheel adjusts the focus of both binocular barrels at the same time. Diopter Adjusts for differences in a user's eyes. Located on right eyepiece. Compatible with a tripod adapter, allowing use on a tripod or car window mount. Package Contents: Vortex Diamondback 10x42mm Binoculars with Rugged Armor DB-205 Eyepiece Cover Objective lens covers Neck strap Case Vortex VIP Warranty The Vortex VIP warranty is about you, not us. It's about taking care of you after the sale. VIP stands for a Very Important Promise to you, our customer. We will repair or replace your Vortex product in the event it becomes damaged or defective-at no charge to you. If we cannot repair your product, we will replace it with a product in perfect working order of equal or better physical condition. You see, it doesn't matter how it happened, whose fault it was, or where you purchased it. You can count on the VIP Warranty for all Vortex Optics riflescopes, prism scopes, red dots, rangefinders, binoculars, spotting scopes, tripods, and monoculars. Unlimited Lifetime Warranty Fully transferable No warranty card to fill out No receipt needed to hang on to If you ever have a problem, no matter the cause, we promise to take care of you Note: The VIP Warranty does not cover loss, theft, deliberate damage or cosmetic damage that does not hinder the performance of the product.